You know, once was a time Nintendo were serious about releasing miniature versions of their consoles. The NES got one (the NES-101), the SNES got one (the SNES 2), but ever since, Nintendo's been all "eh, the original model will do". 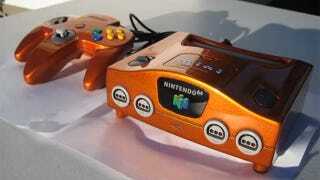 Which is a pity, because smackedsam's shrunken N64 looks terrific! It's not trying to reinvent the wheel, or modernise the original look, it just takes the overall design of the N64 and makes it nice and compact. Which, along with the logos, makes this look official! Those interested, it's actually for sale; you can contact the creator (and seller) at the link below.